Lactose intolerance refers to difficulty digesting lactose, the sugar found in milk. Lactose intolerance can also be variable. Some people avoid all milk products (yogurt, cheese, milk, ice cream, cream sauce); however, others may eat yogurt which is more easily digested due to the partial breakdown of lactose by the bacteria. Certain cheeses, such as swiss cheese, are naturally lactose free and therefore can be substituted easily into a dish for a lactose intolerant friend. One of my favorite cheese companies, Cabot, offers a delicious lactose free sharp white cheddar. I want to highlight that lactose intolerance is very different from a milk allergy. A milk allergy refers to the need to completely avoid all sources of milk protein (including baked in food). Milk allergic friends need to avoid butter and any trace of milk. 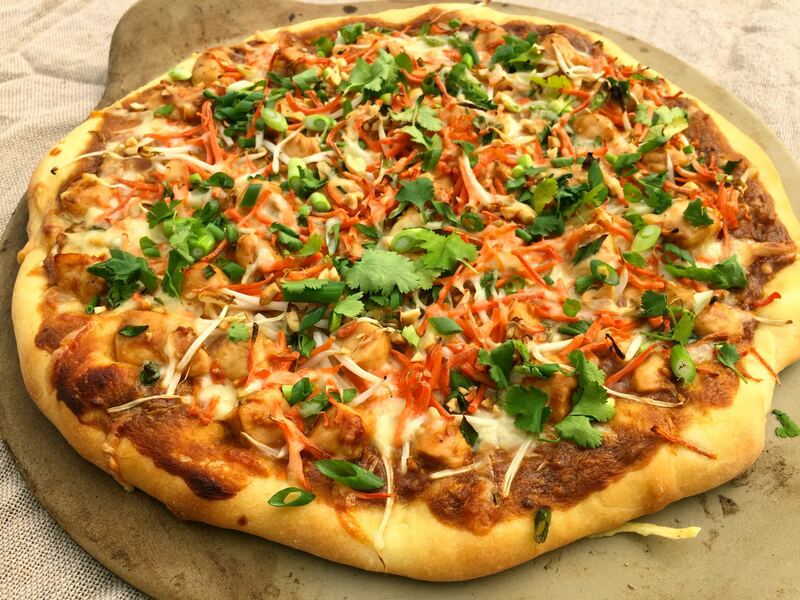 Weekend Thai Chicken Pizza– This pizza is loaded with toppings, including grated carrots, so there is no need to include the cheese. Leave off the cheese or use a lactose free variety. Always a crowd pleaser. Thai Fish Curry (Chatelaine)– Coconut milk adds a creaminess without the lactose. Salmon Burgers with Spicy Avocado Topping– A great idea for your next casual get together. An avocado-based topping means your lactose-free guests don’t have to miss out on the sauce. Gluten free involves the avoidance of the protein in wheat, barley and rye. If a friend follows a gluten free diet due to celiac disease, he or she needs to absolutely avoid all traces of gluten (similar to an allergy). This also means great care needs to be taken into food preparation to minimize cross contamination (think different cutting boards). Luckily, there are are a large variety of gluten free substitutes on the market. Be careful, because gluten free is not synonymous with healthy. Many packaged gluten free products are produced from refined grains. Try to choose naturally gluten free whole grains in your dishes such as corn, quinoa and buckwheat. Instead of serving pasta, try a polenta or risotto. Purchase corn tortillas for a build your own taco bar or serve quinoa or potatoes as a side instead of bread. Fish Tacos– These tacos are up there with those from our local street truck. Ensure you use 100% corn tortillas for gluten free guests. Maple-Seared Scallops with Creamy Kale (Chatelaine)– So gourmet, and only a few ingredients needed. A Vancouverite’s Take on Shrimp and Grits– This dish is perfect served over quinoa! Quinoa Gratin– Veggies, grains and protein in one dish. A go-to for me. Serve with a green salad. Mushroom Risotto– This dish speaks for itself. Also vegetarian if vegetable broth is used in place of chicken broth.